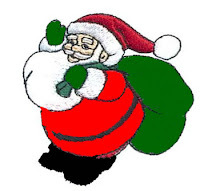 Little Writer Momma: Is Santa Claus Coming to Town? Christmas is 11 days away and I still have mixed feelings about Santa Claus. Perhaps I always will. Here's the thing; Santa was never a part of my life growing up and so I feel a) unsure how to do the whole Santa thing, and b)my parents told me that they never did Santa because they didn't want us to feel like they lied to us so now I feel like I'm lying to my little girl! Ahhh, the challenges of motherhood! Ava is 2 1/2 this year and she gets everything; there is no pulling one over on this toddler! That said, I feel like it is time to start establishing Christmas traditions and being the overly sensitive and heady person I can tend to be I have of course been mulling this over for weeks. It feels strange for me to tell her a story about some fat man in a red suit sneaking into our house at night to leave gifts. It is, in fact, a lie. However, I also feel the cultural pressure to create this magical Christmas facade for her, perhaps because fantasy is part of being a child, right? So besides feeling like I'm lying, my other major issue is that as a Christian it feels, at times, as if Santa has hijacked Christmas. I know Christmas will be what WE choose to make of it, but the media, the ads, the malls; there is so much chaos surrounding the holiday, that the celebration of Jesus birth is completely overshadowed. At the end of the day I'm not really against the story of St. Nick, or the excitement of Santa, I just want the REAL meaning of Christmas to be very true and very prevalent in our family. Before anyone goes thinking I'm a big fuddy duddy about all of this, we have talked about Santa around the house, she sat in his lap at a brunch last week, and recognizes Santa in pictures.I do plan to let her believe that Santa filled her stocking and brought her a couple of gifts (the others will be from her mom and dad). We'll probably leave cookies out and read The Night Before Christmas as well. But, on Christmas morning I also plan to read her her picture book about Jesus' birth, and talk about the gifts the wise men brought for Jesus. We've also created sticker collages of the nativity, have read books about Jesus birth and she can readily identify Jesus, Joseph and Mary. In the future, I hope to instill values of giving by volunteering time to wrap gifts for less fortunate families, or donating to other children. In a world so convoluted with our culture's noise, I think we sometimes need to be quite deliberate about the messages we want our children to hear. I think my questioning is a form of figuring out the message I want my children to receive and making sure it is heard. I posted a question to an online mothers forum that I subscribe to and got 33 responses(as opposed to the usual 7 or 8 about most mundane baby issues)! Most people said, How can you not? Some said that I need to do what feels most right...And many other mothers said they have also asked themselves the same questions and feel like they have found a good balance between playing up the fun of Santa, but still emphasizing the importance of Jesus. We will do something of the same; find a balance between the Santa story and the real story. One woman who responded to my question asked me an interesting question; she asked, "Was there ever a small part of you that wished that maybe your parents had let you believe in Santa, even for a while?" And quite frankly, the answer is yes, I do. I'm glad for the strong moral foundation my parents emphasized and I'm thankful for their commitment to Christian values, but yes, just for a time, I would have liked to set aside reality to believe in some magic for the few years that it was still ok to believe in magic. You are right! I appreciate your perspective and thoughts on trying to find a balance between the two extremes. I'm sure I'll be looking for that balance when my boys are that age, too! Thanks for letting us in on your journey. Ava is very lucky to have such a good mom.